“FirstVoices is a group of web-based tools and services designed to support Aboriginal people engaged in language archiving, language teaching & culture revitalization”. It offers materials in over 60 languages as well as in May, 2016 launched a keyboard which can be downloaded in Mac or Android to offer Indigenous youth the ability to type and communicate in their own language! This was a request I just had in our own school district so I am thrilled to find this and look forward to hearing about it’s possible success. 2. This guide, found at http://portal.acc-society.bc.ca/literacy/storytelling contains information concerned with promoting literacy and language development in young Aboriginal children. Links to many online resources are available, as well as resources from the Aboriginal Childcare Society are available to borrow or purchase. Links to programs such as PALS, teaching information on literacy and language for young children and a link to the First Nations language building guide in BC are some of the many resources found here. 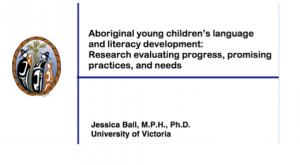 This paper summarizes what is currently known about language and literacy development for Aboriginal children under the age of 6 in Canada. 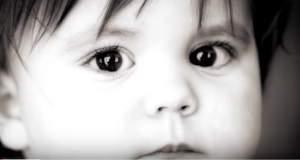 Although I am focusing my literacy research on school aged children, the background of speech –language development and its relationship to literacy later on is integral. We must be aware that Aboriginal children often do not speak in traditional home dialects of English or French, but that these dialects be recognized and respected, not looked at as speech impediments or learning disabilities. Again, this one won’t link directly but needs to be copied and pasted into your browser. This article is a qualitative research study of Indigenous youth in public education in Canada. Background research describing the difficulties facing aboriginal youth in our public school system is outlined, highlighting poverty, effects of residential schools and difficulties in the relationships between Aboriginal families and the schools. “Accordingly, the present study focuses on a qualitative exploration of the perspectives of small groups of Aboriginal students (Grades 4 through 8) as well as teachers at their schools, regarding facilitators and barriers to school success, including self-concept and academic aspirations. 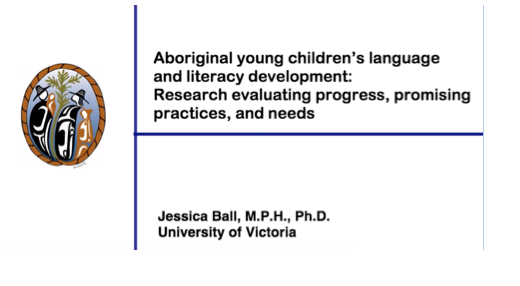 Although this is a small study, capturing the views of a few students and teachers, it is novel in terms of its multi-reporter approach as well as its focus on the voices of Aboriginal students that are rarely heard in the research community”. Its Not an opinion: It’s A fact (You Tube), looks at the facts surrounding Indigenous people in Canada, mostly in percentages rating the differences between Native and non-Native Canadians in everything from poverty rates, school completion, job opportunities and incarceration statistics. The film ends with the statement, ”There is hope”. Hope, I believe, lies in the relationships between First Nation Canadians and non-First Nations Canadians, relationships which are gaining strength through reconciliation, understanding and an improved BC Curriculum. It was heartening hearing the stories of youth in the videos at the end of Module 3.